The relationships between climate, crop, water, and soil are complex with many biological processes involved. Climate change is expected to have many adverse impacts agriculture, which is considered to be the most tangible affected sector. 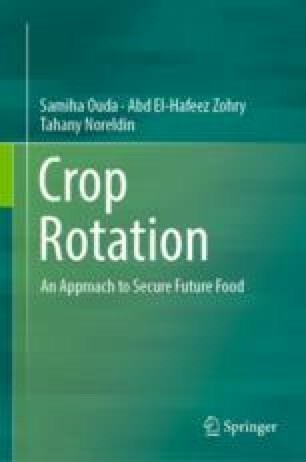 In this chapter, we used the knowledge we learned from the previous chapters to suggest intensive crop rotations to be implemented in 2030 under climate change. The suggested crop rotations were designed to tolerate the stressful effects of climate change, namely loss in the productivity of its crops, rise in its required irrigation water, and the degradation of the cultivated soils. Thus, it could maximize food production and diminish irrigation water losses, which will lead to maximize land and water productivities. The increase in the projected water requirements of the cultivated crops in these rotations were calculated in 2030 using RCP6.0 climate change scenario resulted from MIROC5 model. The results indicated that implementing the suggested rotations in 2030 could alleviate the harmful effect of crop rotations, where more food could be produced, some irrigation water can be saved and minimized soil degradation, as a result of increasing number of legume crop.